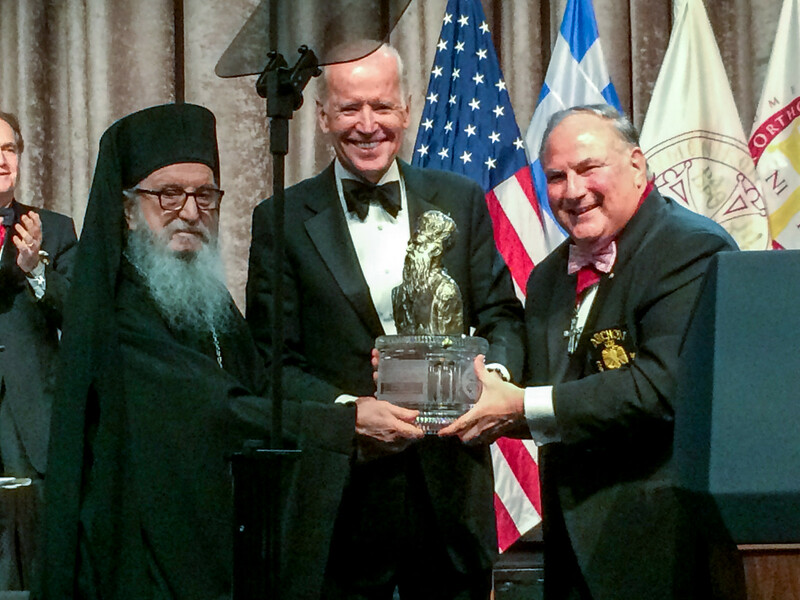 Archbishop Demetrios of America, Exarch of the Ecumenical Patriarchate together with Archons’ National Commander Dr. Anthony J. Limberakis presented the Athenagoras Human Rights Award to Vice President of the United States Joe Biden. 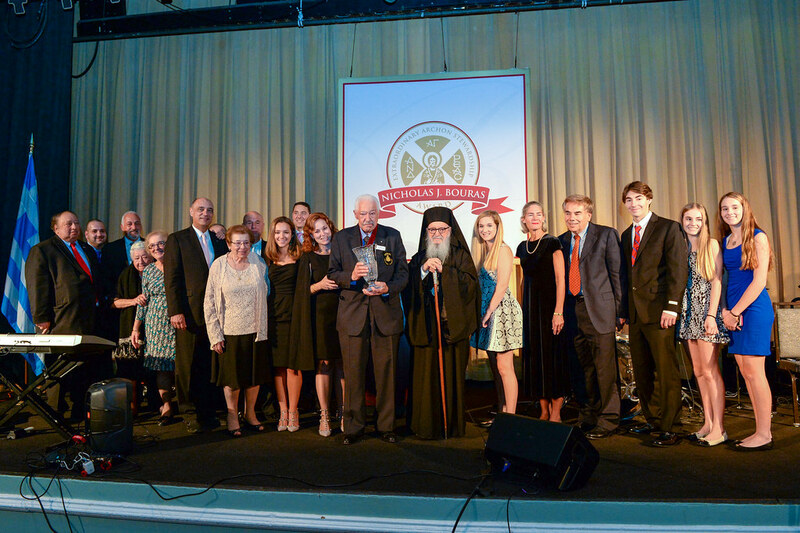 The Award was presented during the Order of St. Andrew the Apostle, Archons of the Ecumenical Patriarchate Award Banquet held at the New York Hilton, Oct. 17, 2015. The Order of St. Andrew “is honored to honor you,” said National Commander Limberakis to the Vice President as he presented the award. Dr. Limberakis spoke of the history and the meaning of the Award, the personality and the ministry of the “spiritual giant” Ecumenical Patriarch Athenagoras of blessed memory who toiled as a partner of the United States in defense of freedom and liberty. He further presented the fight of the Order of St. Andrew in defense of human rights, religious freedom and the rights of the Ecumenical Patriarchate. “We thank you for all you have done and all you will do in the future for the Ecumenical Patriarchate,” he concluded. A video message of His All-Holiness Ecumenical Patriarch Bartholomew followed in which the Ecumenical Patriarch paid tribute to the Vice President. “This is maybe the greatest honor I have ever received in my public life,” said the Vice President in accepting the Award. Biden recounted the fulfilling and moving spiritual experience of his two visits to the Ecumenical Patriarchate, praised Ecumenical Patriarch Bartholomew and said that he is the most blessed man he has ever met in his life, a saintly man. The Vice President said that throughout his career, the absolute commitment to freedom of religion as something we posses simply because we are children of God, has been a guiding principle. Speaking about the Ecumenical Patriarchate, he said that the Greek Orthodox Church must have the right to control its own destiny free of the influence of any government at all. 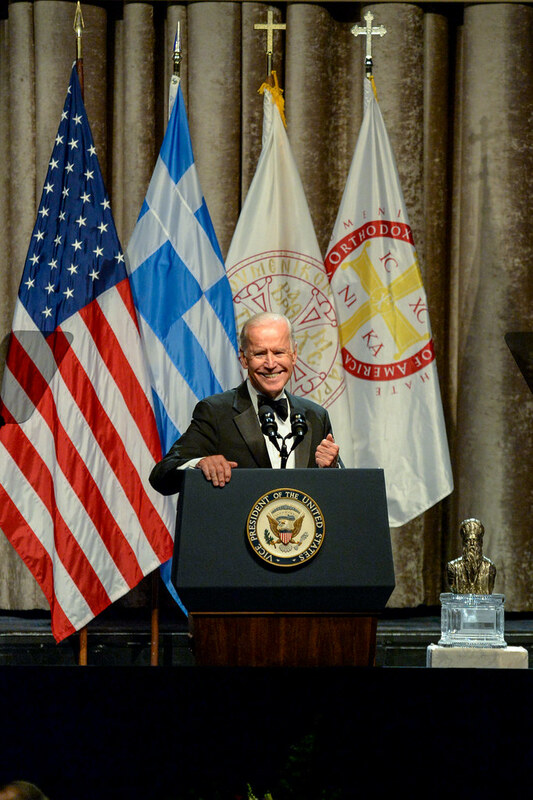 Archbishop Demetrios, in his response, congratulated and praised Vice President Biden as worthy “Axios” of the Athenagoras Human Rights Award. Archon Michael Psaros introduced the dais guests at the beginning of the program, the national anthems were sung by Eva Agathis. Vice Commander John Halecky, Jr. offered the welcoming remarks. Archon Mike Emanuel, Chief Congressional and Senior Political Correspondent of FOX News was the Master of Ceremonies. 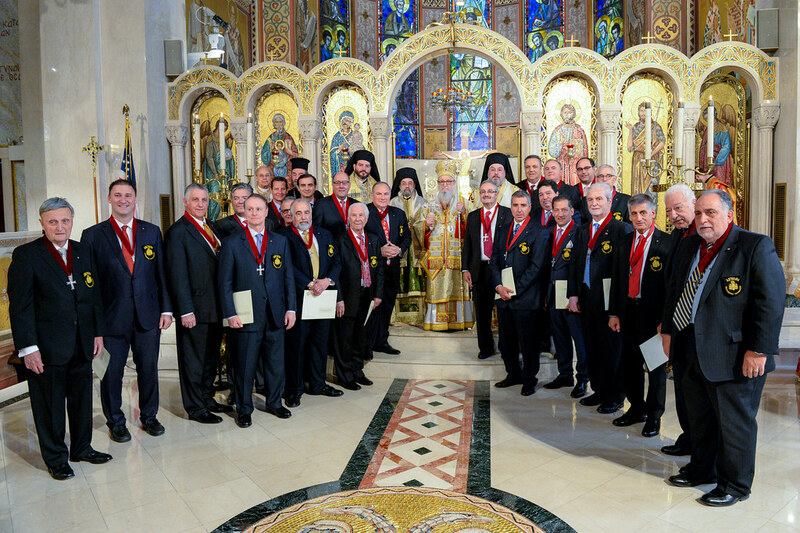 His Eminence Archbishop Demetrios of America joined the Order of Saint Andrew in honoring Hon. Nicholas Tsoucalas by bestowing upon him the "Nicholas J. Bouras Award for Extraordinary Archon Stewardship." The Award was presented during a special celebratory dinner dance held at the New York Hilton Hotel, which launched the Annual Archon Weekend on Friday, October 16, 2015. Archon Nicholas' was joined by his daughter, Georgia, along with his family as he received the prestigious Award. On Sunday morning, Oct. 18, Archbishop Demetrios presided at the Divine Liturgy at the Cathedral of the Holy Trinity in New York City. Following the Divine Liturgy the ceremony of investiture of the new Archons took place.